Mishti Doi gets a distinct flavor when the milk is boiled in a clay pot over a charcoal oven. While selecting a clay pot, take a wide mouthed clay pot over a narrow mouthed clay pot. Using a wide mouthed clay pot helps milk to evaporate fast and also helps in milk not spilling over the pot. We need to prepare the clay pot before putting it to use. Take a tub full of water and immerse the clay pot in it. Add water till the rim of the tub to see that the pot is fully immersed. Soak the pot overnight in water. Next day take the pot out and rub the inner surface with fingers and observe that the black color of the pot coats the fingers. To prevent this, fill the pot with water and heat it on low flame. After heating the pot for 30 to 40 minutes observe the vapors over the water surface. Then switch off the flame and keep it aside for some time to cool. Drain out water from the pot and rub the inner surface and observe that the black color of the pot doesn’t stain the fingers---this indicates that the pot is ready to use. Take full cream milk into a bowl and heat it. Heat the milk till it reaches a boil. Now transfer the boiled milk to the prepared pot. We can even boil the milk directly in the pot also but observe the milk bowl after transferring milk into the pot. There will be a thick coating at the bottom of the bowl which is formed after boiling milk. When milk is boiled directly in the pot it also gets a thick coating (as shown) at the bottom of the pot. Then, when milk is boiled further to evaporate, the thick layer at the bottom of the pot gets scorched and leaves a scorching smell to the milk—which spoils the taste. To avoid the scorched smell of milk, first boil milk in a bowl and then transfer this milk into the pot and proceed. Now the milk is ready to be boiled further to thicken. Boiling milk in a clay pot gives a distinct flavor to the milk. When the milk in clay pot is boiled over a charcoal oven, it boils slowly forming a thick layer of cream on the surface. Portable charcoal ovens are available in the shops selling clay pots. In olden days people used to cook not only their daily food but also delicacies in these portable ovens. Nowadays we see young generation using a modern portable oven which is familiar with the name barbecue to prepare many grilled dishes for picnics and parties. Here let us use this barbecue to make mishti doi. First know the parts and usage of a barbecue. Barbecue has a stand in which a slotted tray is arranged. Charcoal is lit in the slotted tray. Then find a grill which is placed above the charcoal in the slotted tray. Find a sliding plate beneath the barbecue stand which is used to collect the ash from the burnt charcoal. Take some coconut fiber and open it up with fingers. Spread the coconut fiber in the slotted tray evenly. Cover the coconut fiber with charcoal and keep the slotted tray ready. Bundle up few newspapers and place them in the ash tray. Using a match stick lit the newspapers and immediately set the prepared slotted tray in the stand. Using a plate or a card board, blow air, above the charcoal. The fiber catches fire from the burning newspapers through the slots of the tray. Once the fiber starts burning the charcoal is lit. Thus the barbecue is ready for using. Place the milk pot above the burning charcoal. Add sugar and mix well with a ladle till sugar dissolves. As the flame is a charcoal flame which would be less only and as we are using a wide mouthed pot, it would not allow the milk to spill over. However if there is any doubt of milk spilling over mix with a ladle—as the milk starts evaporating it would not spill over. Milk boils inside the pot as we are using a wide mouthed pot. Reduce milk by boiling over low flame for a thicker cream. After some time observe a change in color of the cream on top of the milk. Sugar caramelizes and gives a nice color to the milk. Allow the milk to boil to reduce further. Place a slotted plate on the pot and leave the milk to boil till the charcoals puts off—by that time milk reduces sufficiently forming a thick cream on top. Cool the milk for a while before adding buttermilk to set curd. In winters it would be difficult to set curd so, add buttermilk to the milk while the milk is still hot (Temperature between 50oC to 55oC). As shown in the movie I have added buttermilk, when the milk is at 53.5oC on candy thermometer. From one side, separate the cream with a spoon and add buttermilk to the milk & mix with spoon. Cover the milk bowl and allow to set. It is advisable to use a rice cooker to set curd fast in winters. Add water to the rice cooker bowl. Place the milk pot in the rice cooker and see to it that it doesn’t touch the water in the rice cooker bowl. Cover the rice cooker and switch on “Keep Warm” mode. As the milk sets, Mishti Doi would be ready. Keep the pot in fridge for few hours before serving. Serve mishti doi in small cups with a spoon. Mishti Doi is a delicacy made in eastern parts of India. Mishti means Sweet and Doi Means Curd (Dahi)---Sweetened Curd. Use full cream milk to prepare Mishti Doi as the thick cream set on top would be very tasty. 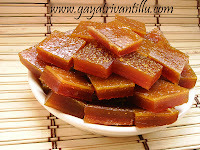 Add sugar as per requirement—I have used 200gms of sugar and the sweet is moderate. I have used around 10ml of buttermilk for setting curd---use as per ones requirement. 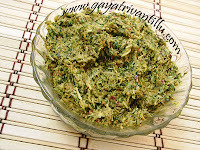 Use buttermilk in place of curd as it mixes well with milk and sets surely and fast. Use a wide mouthed clay pot than a narrow mouthed clay pot. As the surface area would be more milk boils inside the pot only when using a wide mouthed pot whereas it spills over in a narrow mouthed pot. Using a clay pot gives a special flavor to the milk. Using a charcoal oven gives a thick layer of cream. As flame heat would be less in charcoal oven milk boils slowly yielding a thick cream. To avoid the scorching smell boil milk in a steel container first and then transfer it to the clay pot. Then reduce the milk by boiling in clay plot over charcoal oven to get thick cream and flavored mishti doi. Milk boiled in clay pot over dried cow dung fire gives another unique flavor to the mishti doi. To prevent accidents and smoke lit the barbecue in an open place till the charcoals are lit well. Reduce milk to ones requirement. 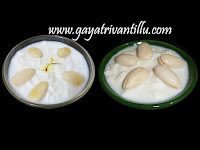 Reduced milk gives thick curd---however do not reduce to such a level where the curd sets like stone---then it would taste like Khoa Or Mawa. Here I have reduced to little more than half the quantity (2 Liters Milk to Approximately 1 1/4 Liters). Sugar flavored milk takes longer time to set and in winter weather it takes even longer time. So it is advisable to use rice cooker as shown in the movie to set Mishti Doi. One important point to notice is it would be heavier on stomach as the curd is made with reduced milk and is sweetened too. So eat in limited quantity and enjoy the unique taste.